Hear ye, hear ye! Guys and gals! Don't you dare miss all this madness! You could find your ideal graduation gifts for your kids, siblings, friends at the MARKDOWN MADNESS SALE event of the month! Let me roll the details! What: MARKDOWN MADNESS SALE of up to 70% off on shoes, apparel and accessories from your favorite brands like Skechers, Ecko Unltd, Zoo York, and a whole lot more! 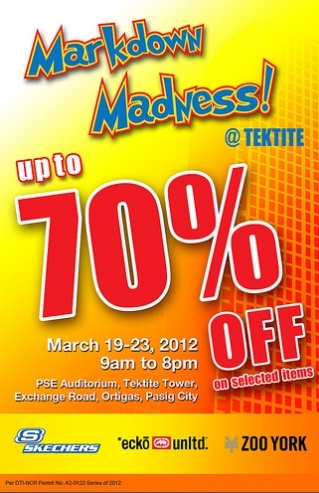 Drop by at the Tektite Auditorium anytime from 9am-8pm on March 19-23, 2012. See you there! Wow that's a big sale, 70% you can buy a lot of shoes and resell it afterwards.